The City of Chicago released its 2017 Comprehensive Annual Financial Report (CAFR) earlier this summer. This blog will examine the City’s Corporate Fund (i.e. General Fund) fund balance as a percent of general operating expenditures based on audited data from the City’s most recent CAFR. This ratio serves as a measure of whether a government is maintaining adequate levels of fund balance to mitigate current and future risks and ensure stable tax rates. The City considers its budget stabilization funds to include some components of its Corporate Fund fund balance and its asset lease reserves. The Civic Federation will provide a full analysis of all reserve funds in its annual analysis of the City of Chicago’s FY2019 proposed budget when released later this year. However, only Corporate Fund fund balance will be examined in this blog post. Fund balance is a term commonly used to describe the net position of a governmental fund. Fund balance is an important financial indicator for local governments and serves as a measure of financial resources. It represents the difference between the assets and liabilities in a governmental fund. Fund balance in the general fund is more a measure of liquidity than of net worth and can be thought of as the savings account of the local government. Nonspendable fund balance – resources that inherently cannot be spent such as pre-paid rent or the long-term portion of loans receivable. In addition, this category includes resources that cannot be spent because of legal or contractual provisions, such as the principal of an endowment. Restricted fund balance – net fund resources subject to legal restrictions that are externally enforceable, including restrictions imposed by constitution, creditors or laws and regulations of non-local governments. Committed fund balance – net fund resources with self-imposed limitations set at the highest level of decision-making which remain binding unless removed by the same action used to create the limitation. Assigned fund balance – the portion of fund balance reflecting the government’s intended use of resources, with the intent established by government committees or officials in addition to the governing board. Appropriated fund balance, or the portion of existing fund balance used to fill the gap between appropriations and estimated revenues for the following year, would be categorized as assigned fund balance. Unassigned fund balance – in the General or Corporate Fund, the remaining surplus of net resources after funds have been identified in the four categories above. Unrestricted fund balance includes the combined total of committed fund balance, assigned fund balance and unassigned fund balance and is the portion of total general fund balance that analysts often examine when evaluating general fund fund balance levels because it is the amount of fund balance that the government itself has placed restraints on its use or is without constraint. The Government Finance Officers Association (GFOA) provides guidelines on the appropriate level of fund balance that governments should maintain, calculated in accordance with generally accepted accounting principles. The GFOA recommends that “general purpose governments, regardless of size, maintain unrestricted budgetary fund balance in their general fund of no less than two months of regular general fund operating revenues or regular general fund operating expenditures.”  Two months of operating expenditures is approximately 17%. GFOA also states that in practice, a level of unrestricted fund balance lower than the recommended minimum may be appropriate for states and America’s largest governments, such as cities and counties, because they can often better predict contingencies and they typically have diverse revenue streams. Further, the statement directs governments to consider the financial resources available in other funds when determining an adequate unrestricted General Fund fund balance level. GFOA recommends that governments establish a formal unrestricted fund balance policy that considers the government’s specific circumstances. GFOA specifies several factors that should be considered when establishing a fund balance policy: revenue predictability and expenditure volatility; perceived exposure to one-time disasters or immediate expenses; the potential drain on general fund resources from other funds and the availability of resources in other funds; the potential impact on the government’s bond rating and borrowing costs; and funds that are already committed or assigned for specific purposes. 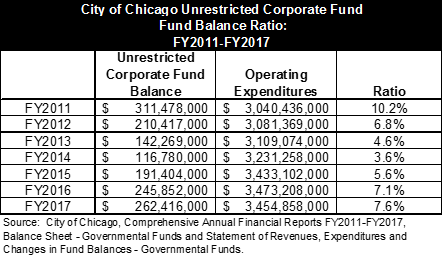 The table below presents a seven year analysis of unrestricted Corporate Fund fund balance from FY2011-FY2017. A ten-year trend analysis of the City’s fund balance ratio is not possible because the data has been classified differently with implementation of GASB Statement No. 54. Between FY2011 and FY2017, unrestricted fund balance fell from a high of 10.2% of operating expenditures in FY2011 to a low of 3.6% in FY2014. In the following three years, the fund balance ratio has steadily increased to 7.6% in FY2017. The City’s FY2017 unrestricted fund balance consists of $106.9 million that has been assigned for specific purposes, which includes $15 million for the Operating Liquidity Fund and $155.5 million that is unassigned. The City attributes its growth in unassigned fund balance since FY2014 in part to economic growth, enhancements in debt collection, investment strategies and ongoing savings and efficiencies. The City’s 7.6% fund balance ratio is lower than the GFOA recommendation of 17%. However, as previously mentioned, the GFOA acknowledges that it may be appropriate for states and the country’s largest governments with a diverse revenue base and better position to predict contingencies to maintain a smaller fund balance based on the government’s own financial policies and other available financial resources. GFOA, “Fund Balance Guidelines for the General Fund” (Adopted September 2015). Stephen J. Gauthier, The New Fund Balance (Chicago: GFOA, 2009), p. 34. Stephen J., Gauthier, “Fund Balance: New and Improved,” Government Finance Review, April 2009 and GASB Statement No. 54, paragraph 5. Gauthier, Stephen J., “Fund Balance: New and Improved,” Government Finance Review, April 2009. GFOA, “Fund Balance Guidelines for the General Fund” (Adopted September 2015). Again, the City of Chicago considers its separate asset lease reserve fund as a part of its budget stabilization funds. City of Chicago 2018 Annual Financial Analysis, Appendices, p. 117. City of Chicago 2018 Annual Financial Analysis, Appendices, p. 118. A City of Chicago Income Tax? The following blog post examines the possibility of the City of Chicago instituting a city income tax. The idea was discussed by several mayoral and aldermanic candidates in the recent Chicago 2019 municipal election. We welcome any questions and feedback about the content of this blog. Please e-mail [email protected] with your query.